JACKSONVILLE, Fla. — The Jacksonville Jaguars haven’t lost consecutive games all season. If they’re going to stay in the AFC playoff picture, they can’t let it happen now. The Jaguars (7-4) expect to bounce back from their first loss in six weeks when they host the Indianapolis Colts (3-8) on Sunday. It’s far from a must-win for the home team, but one the Jaguars believe they need to stay on track for the franchise’s first postseason berth in a decade. It’s also the first of three consecutive home games for the Jaguars, a stretch that could cement their playoff position or leave them needing help in the closing weeks. The Colts have dropped five of their past six and are on the verge of elimination in the AFC South. “We’re not where we want to be record-wise, but we feel like we’re making progress and headed in the right direction,” coach Chuck Pagano said. Pagano noted his team has lost four games by four points or fewer, all one-possession games late in the fourth quarter. “We’re constantly racking our brains and doing everything that we can do as players and coaches to try to figure the things out,” Pagano added. 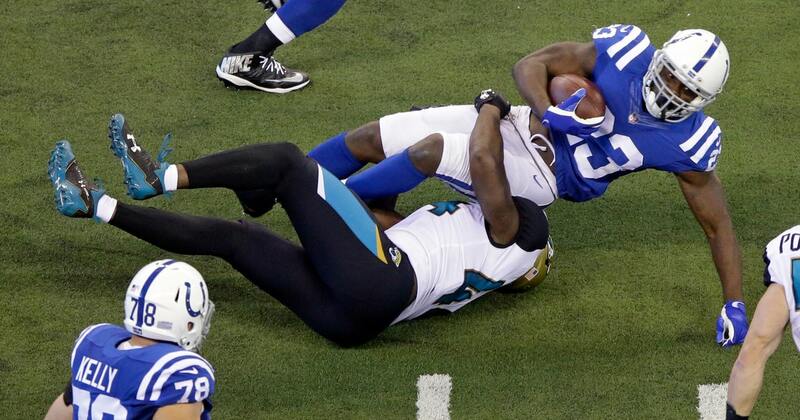 The Colts have played better in the four games since getting beat 27-0 by Jacksonville at home in late October. The Jags finished with 518 yards, 10 sacks and their first shutout since 2006. They expect a much different showing from the Colts in the rematch. “They’re rolling on offense. They’re doing some great things. They’re getting more players involved,” Jaguars cornerback A.J. Bouye said. Jacksonville lost 27-24 to the Cardinals thanks partly to Phil Dawson’s 57-yard field goal with 1 second remaining. The Jaguars finished with a season-low 219 yards, including 91 on the ground, and were doomed by three turnovers and several dropped passes. The NFL’s top-ranked defense got burned by two long touchdown passes and allowed Blaine Gabbert to complete two first down passes in the final seconds to set up Dawson’s winning kick. And coach Doug Marrone acknowledged a mistake by calling for a pass on a second down play instead of running out the clock and going to overtime. SOFT SPOT? Jacksonville’s defense seems vulnerable to tight ends. Of the nine passing touchdowns the Jaguars have allowed, four have been to tight ends. Jack Doyle leads Indy with 59 receptions, including six for 44 yards against Jacksonville in October. “Maybe they feel that’s a more favorable matchup for them,” Marrone said, noting how well Bouye and fellow cornerback Jalen Ramsey have played. LINE DANCE: Having given up a league-high 47 sacks, including 10 in the first meeting, Indianapolis will face Jacksonville with another makeshift line. Pagano said it’s unlikely center Ryan Kelly will make it through the league’s concussion protocol in time to play. SHOE GAME: Players from both teams will wear special shoes for the league’s annual “My Cause, My Cleats” campaign. Jaguars receiver Dede Westbrook is bringing awareness to domestic violence several years after being accused of attacking the mother of his children. “I wanted to use my image and my platform to show the young kids to think before you act,” he said.